One of the central parts of any divorce is the division of property. In general, if you acquire an asset during a marriage, the law presumes that it is community property, but you can overcome that presumption if you have enough evidence showing that it is actually separate property. As a recent ruling from the Third District Court of Appeal demonstrates, if you seek to overcome this presumption by tracing the source of funds used to purchase an asset during the marriage, there is a very specific way you have to go about doing this. In this case, the wife failed to present the right kind of evidence, and she lost the right to reimbursement for the down payment on the couple’s Northern California home. The decision was the latest ruling in the prolonged divorce process involving Billie Miller and Dane Cooper. The couple married in 1988. They purchased a home north of Sacramento. By 1995, the husband moved to Ohio, while the wife remained in Northern California. Nine years later, they separated. In 2006, the wife filed for divorce in California. As part of that divorce action, the couple asked the trial court to decide certain issues related to their home in Oak Grove. They had already agreed that the home was community property. What they did not agree upon, though, was the allocation of certain expenses related to the house that arose during the time when they were legally separated but still married. The wife sought, as part of the property division order, to be reimbursed for the down payment on the house, arguing that the payment was made using her separate property. She also contended that the division order should credit her for the money she paid on repair and maintenance expenses for the house during the separation period. The trial court agreed that the wife paid the down payment using her separate property and was entitled to reimbursement for that. The court also granted the wife’s request for credit for the money she paid upkeeping the house during the separation. The husband appealed, and the appeals court agreed with the husband that the trial court should not have ordered reimbursement to the wife for the down payment on the house because she fell short of proving that the payment was made with her separate property. California creates a strong presumption that an asset obtained during a marriage is community property. A spouse can overcome that presumption, but it takes a very specific type of proof to accomplish this end. It requires “tracing separate property contributions to property acquired by the community during the marriage.” This tracing requires clear references to specific written documents with clear linkages that show that the source of the funds was separate property. Oral testimony is insufficient. In this divorce, the wife only had her oral testimony and her general references to a collection of dozens of account statements, none of which contained a withdrawal of anything like the $40,656 down payment made in 1991. Without this specific linkage to clear documentation, the wife fell short of overcoming the presumption in favor of a finding of community property. Addressing all of the issues involved in a California divorce requires skill, knowledge, and a keen attention to detail. The experienced San Diego divorce attorneys at Doppelt and Forney, APLC have been helping clients throughout Southern California, including in San Diego, Encinitas, La Jolla, and Chula Vista, with all of their divorce-related legal needs for years. 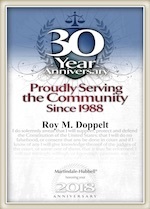 For a free consultation about your divorce, reach out to Doppelt and Forney, APLC through our website or call toll-free at (800) ROY IS IT (769-4748).